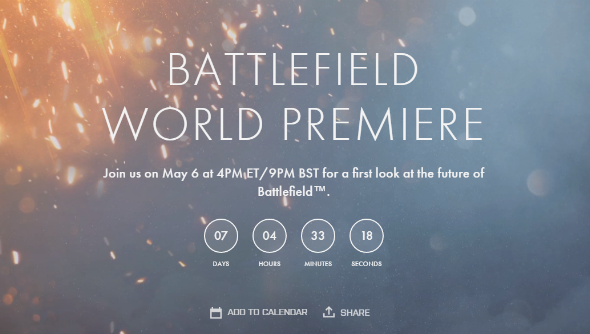 The future of the Battlefield franchise will be revealed on Friday May 6 when the first trailer for the next game will be shown at a World Premiere event. For the finest in military action check out our run-down of the best World War II games. The event will also be livestreamed on Twitch, offering fans a chance to see the new game at 9pm BST (1pm PT) before a panel session with the developers begins. EA revealed in an email to outlets today that DICE creative director Lars Gustavsson and lead producer Aleksandr Grondal will discuss “the past, present and future” of the Battlefield franchise. Previous reports on the unannounced game, taken from listings by online retailers in Germany, have suggested the next instalment could take place during World War I. Viewers on Twitch will be able to ask the two members of DICE’s development team questions, and those who sign up for EA’s Battlefield Insider program will receive in-game rewards, exclusive content and first word on news about the game.